Connect two Inverters Generators and get twice the power. This Parallel kit works with Ryobi, Power stroke, Gravely, and Ariens Inverter Generators. Double your power out-put for heavier power needs. This Parallel kit is built to hold up- featuring heavy-duty construction, and universal mounting tabs. The DEWALT DCE100M1 Blower Kit is ideal for clearing work areas or blowing debris off tools. This blower features a 3-Speed variable speed switch providing control and versatility. Also included in this kit are 3 nozzles, a 4.0Ah battery and charger. Introducing the world's first String Trimmer with an POWERLOAD head. One of the biggest pain points of lawn care is now as simple as pushing a button. Just feed the line and press to wind! The NEW EGO POWER+ 15 inch Auto-Wind String Trimmer features the world's first Carbon Fiber Shaft with a lifetime warranty so the strength and durability is guaranteed to last forever! It's also equipped with a Hi-Efficiency Brushless Motor, Bump Feed Line Advance, and is compatible with all EGO ARC Lithium batteries to maximize the convenience of cordless and deliver Power Beyond Belief. EGOs new 15 inch rear motor String Trimmer offers a staggering 1200-Watt output. The robust design provides gas performance without the noise, fuss or fumes. While the Rapid Reload head allows users to quickly and easily load new cutting line. Compatible with all EGO ARC Lithium batteries for Power Beyond Belief. Introducing the worlds first cordless hedge trimmer with a 1 cut capacity. The NEW EGO POWER+ Hedge Trimmer has a Hi-Efficiency Brushless Motor for longer run times and a 24 inch dual action, hardened steel blades for precise, clean cuts. It delivers 3,000 strokes per minute to get the tough jobs done faster and features EGO's industry-leading ARC Lithium Battery Technology compatible with all EGO ARC Lithium batteries to maximize the convenience of cordless and deliver Power Beyond Belief. Inverter Generator Parallel Kit Connect two Inverters Generators and get twice the power. This Parallel kit works with Ryobi, Power stroke, Gravely, and Ariens Inverter Generators. Double your power out-put for heavier power needs. This Parallel kit is built to hold up- featuring heavy-duty construction, and universal mounting tabs. 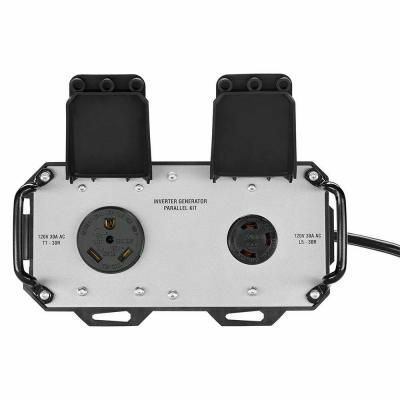 Inverter Generator Parallel Kit is rated 4.6 out of 5 by 38. Rated 5 out of 5 by Bob from Very Good Product. Very Good Product. Rated 5 out of 5 by Studaddi from There is nothing to this, just plug and play as... There is nothing to this, just plug and play as described.